Carl “Eugi” Hall can hear colors. The native Washingtonian painter/illustrator is on a mission to interpret the colors of music. Influenced by Wassily Kandinsky, Walt Disney and Prince, he has experimented with various styles and mediums from his youth to adulthood. He was that kid always drawing and painting his creative thoughts on whatever surface available. Whether it was on paper, canvas, clothes or the side of a building, seeing his visions in real life felt magical. 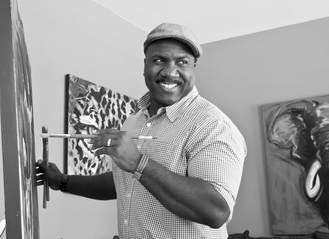 A self-taught artist, he has exhibited his work throughout the Washington, D.C./Baltimore area in several solo and group exhibitions. One may describe his work as figurative abstract or maybe even abstract realism, but to him it’s all a “colorful jam session”. "Imagining the sound colors make is the foundation of my creative spirit. Inspired by my past experience as a musician, I naturally rely on the characteristics of music to create artwork that possesses a mood and movement. The intensity of color or form of a brushstroke, feels the same to me as the flow of a melody or richness in harmony. Using different mediums and styles I often explore all sorts of subject matters, but my passion for music represents the majority of my work. Painted mostly in acrylic, these bold and vibrant abstracts are what I like to call, “Assorted Music Art”. Each piece unconsciously captures the sensations and colors pumped in my headphones or from the speakers during their creation. They’re intended to invite each viewer, to apply their own unique imagination, to hear what they see. The sound of colors."